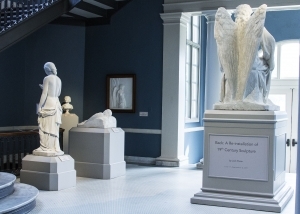 Designed to showcase the museum’s nationally known collection of mid- to late-nineteenth-century sculpture, the Sculpture Court features plaster, marble, and bronze sculptures, and framed bas-reliefs by Albany sculptor Erastus Dow Palmer and his three studio assistants and protégés, Launt Thompson, Charles Calverley, and Richard Park. As a photographer, curator, and collector of eclectic materials ranging from historic photographs, old master drawings and prints, Tibetan thankas, and 1930s Danish furniture, Jack Shear enjoys the art of observation, sometimes with a twist. Shear is the juror of the 2017 Exhibition by Artists of the Mohawk Hudson Region (2017 MHR). His particular interest inspired a temporary artistic installation that will run the length of the 2017 MHR... Back: A Re-Installation of 19th Century Sculpture by Jack Shear shines a light on the backs of the figural sculptures featured in the Sculpture Court.